Echo by Pam Muñoz Ryan is the Hamilton book of the week nominated by Whitney Fessler, the librarian at Lookout Mountain Elementary. “The kids at my school love historical fiction, especially the World War II period. This book shows the story of three different kids and one special harmonica that they all share, and their experiences during the war,” Ms. Fessler said. Echo is a longer book, but well worth the read.Lost and alone in a forbidden forest, Otto meets three mysterious sisters and suddenly finds himself entwined in a puzzling quest involving a prophecy, a promise, and a harmonica. D"ecades later, Friedrich in Germany, Mike in Pennsylvania, and Ivy in California each, in turn, become interwoven when the very same harmonica lands in their lives. 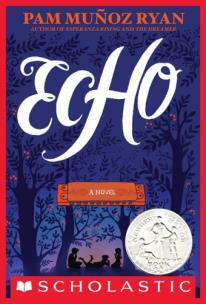 Echo is an uplifting, historical, and interesting book for readers of all ages. Echo is a historical novel with a fantasy element. It includes information about the beginning of the Holocaust, the Great Depression, and what life was like in America after Pearl Harbor, including how Japanese people were sent to internment camps. Readers also will learn that in some California school districts in the 1940s, kids with Mexican ancestry were sent to separate and inferior schools. The three main protagonists -- Friedrich, Mike, and Ivy -- all face injustice. Nazi soldiers call Friedrich "the ugly son of a Jew-lover" after taking his father to a labor camp. Mike and Frank are at the mercy of a cruel and calculating orphanage director and later thrown out of a store, suspected of being thieves. Ivy must go to a school for Mexican students. They learn about other injustices, too (for example, the family that owns the farm Ivy lives on is sent to a Japanese internment camp). There's some violence, from fistfights to war injuries, and one soldier dies. But the protagonists speak up in their own way for what's right and continue to think of ways to help others who also are suffering. They eventually learn "to hope for the best and that no matter how much sadness there is in life, there are equal amounts of maybe-things will-get-better-someday-soon." To see all Hamilton Book of the Week editions, visit here. "Hamilton Book of the Week seeks to move Hamilton County Schools closer to district goals found in the Future Ready 2023 action plan," officials said. "We hope to encourage kids to read more books for fun by sharing books popular at area schools.